Our 100% home record came to an end on an afternoon which saw the weather the real winner as both sides drew a blank in the driving wind and rain. There was one change from the side which had beaten Bo’ness with Jordan Morton coming back in to replace Mark Ramsay. We were by far the better side for the entire match, against the fourth top visitors, but on the day a mixture of outstanding goalkeeping and off target shooting ensured that the Sons left with a point. The problems the wind could cause was underlined in the second minute when Prunty's cross from the right hit Mbu and flew up in the air and with the gale carrying the ball towards the line Flynn gathered well with Agnew waiting for a slip. We responded in five minutes with a measured pass from Cameron which sent Cowan racing into the Sons' box and as he pulled the trigger McNiff'’s sliding tackle deflected the ball to safety. 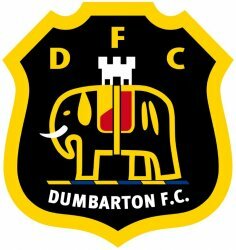 There was a comical moment in the eighth minute when a piece of plastic advertising board flew down the park and was grabbed by Mbu, after several failed attempts by Dumbarton players! In 25 minutes we threatened when Morton moved towards the danger area and his 18 yarder was brilliantly turned around the post by Ewings. Two minutes later Stewart shrugged two challenges and moved into the box and his fierce shot was blocked by Ewings and Adamson, following up, fired over. On the half hour Cowden threatened again when Morton beat his marker and saw his shot beat Ewings but a brave sliding challenge by Lithgow cleared the ball off the line. Four minutes later Naismith's 18 yard shot looked too straight but Ewings fumbled the ball and it slid towards the line only for the keeper to recover and grab it before it went into the net. We opened the second period brightly and in 52 minutes Naismith's low shot pulled out another fine save from Ewings and from Linton's corner O'Brien headed over. Stewart hoodwinked two defenders two minutes later only to see the keeper make a magnificent stop. Dumbarton gradually got into the game and Wallace shot over from a good position after a nice move down their right hand side. We then introduced our substitutes to try and break the deadlock and in 78 minutes Coult fed McKenzie but he fired wide. Then the pair combined again with eight minutes left when McKenzie fired over a good cross and the big striker headed agonisingly wide from eight yards out. Sons were not totally out of it and with four minutes left Winters' 14 yarder was excellently saved by Flynn and then Lithgow headed over. No goals but both sides would have felt they should have hit the target.